First in the market DSD volume can be bit perfect controlled directly using WIN/MAC/LINUX system volume mixer with our customized firmware. No need to annoying manual switch ASIO output everytime for PCM to/from DSD playback in foobar2000 as using the other famous USB I2S module. ES9018K2M is the new flagship model 127dB DNR -120dB THD+N of K2M series from ESS technology who also make the renowned ES9018. It includes the same Patented Time domain Jitter Eliminator used in ES9018 and latest PLL enhancement. 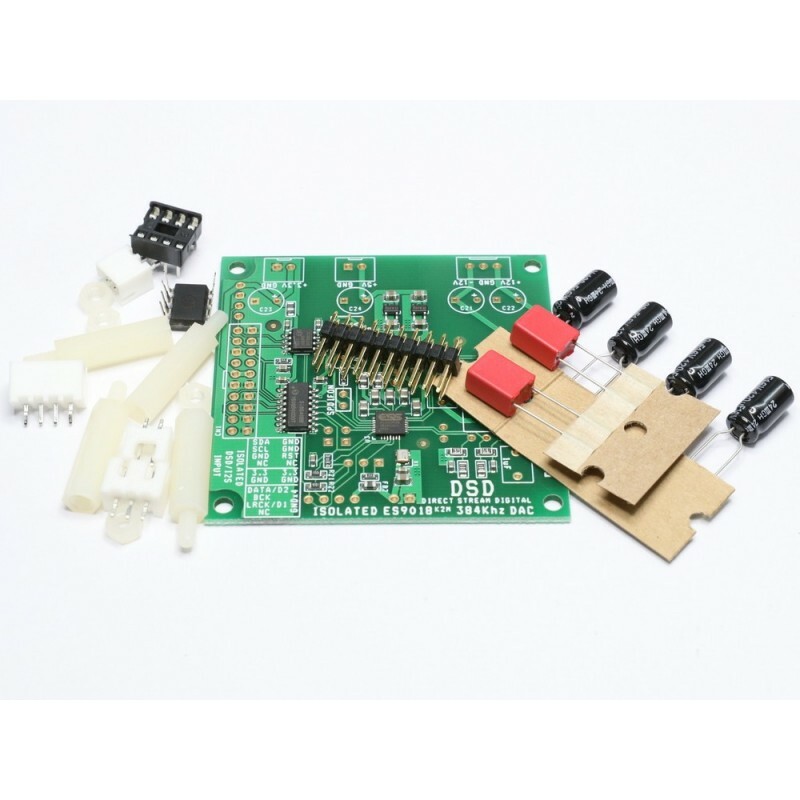 This ES9018K2M PCB uses ultralow phase noise NDK NZ2520SD 80Mhz oscillator with optimized layout(2mm decouple capacitor distance) and selected high quality components(0.1% low noise thin film resistor, C0G capacitor in the LPF, WIMA Film capacitor and panasonic low ESR aluminum electrolytic capacitor etc), it can playback upto 384khz I2S/DSD128 input asynchronously with OSF on and no unlock problem. 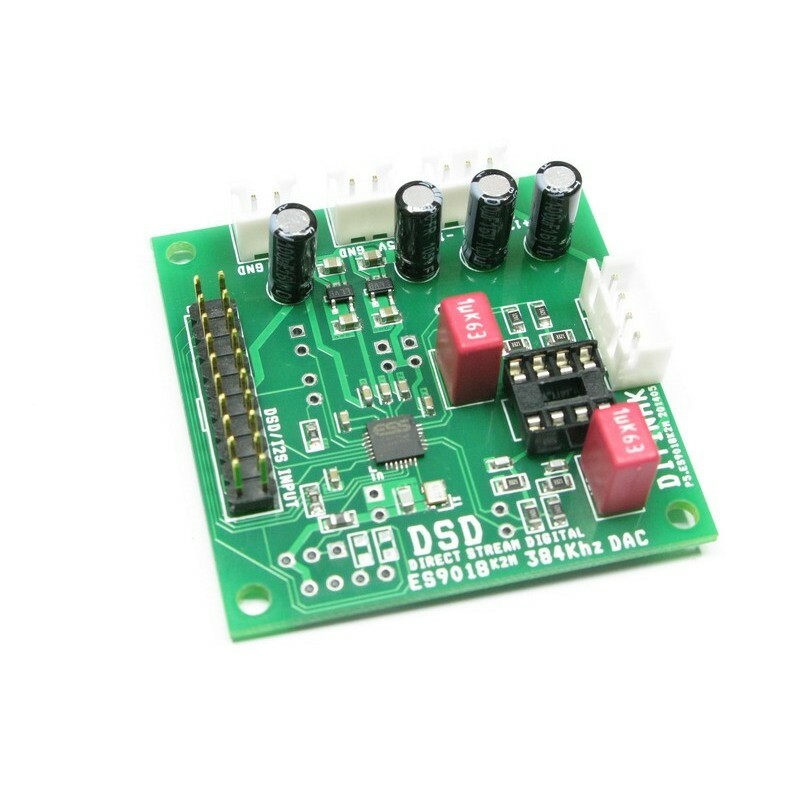 The USB DSD DAC combo includes XMOS USB to I2S PCB, ES9018K2M DSD DAC PCB and an LED sampling rate indicator PCB. 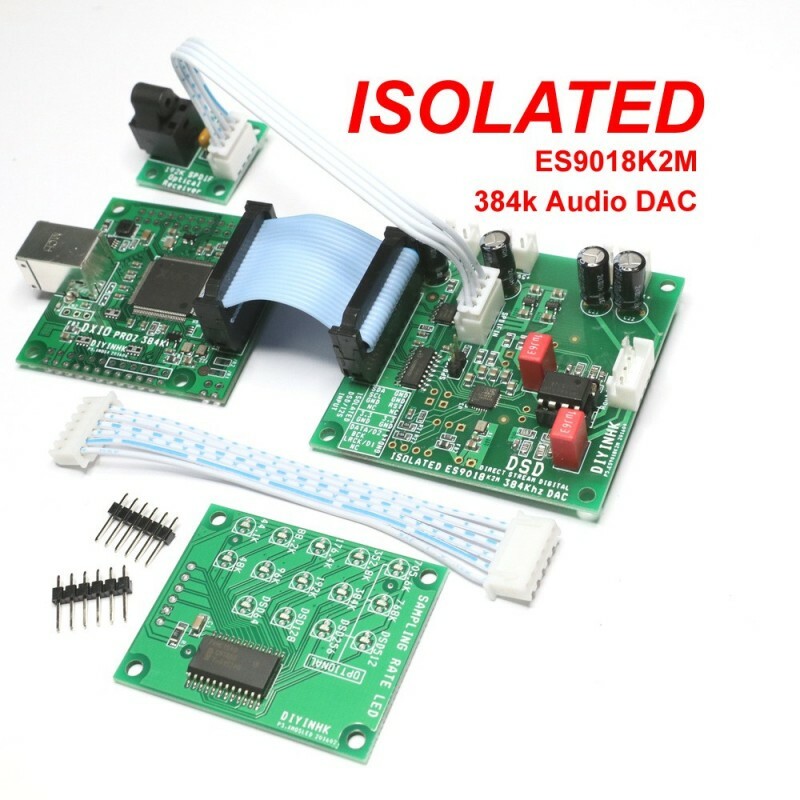 *When the ES9018K2M PCB used with our customized I2C control firmware XMOS USB PCB, extra features include a simple jumper(labeled SPDIF ON) to switch between SPDIF(labeled SPDIF IN) and USB input, bit perfect volume control as well as DSD/PCM playback in foobar without the need to switch ASIO driver everytime. *All SMT component are soldered, some thru-hole component are not soldered. *High performance and compact DSD DAC solution for everyone. The most distinctive features of this USB DSD DAC is our customize firmware for bit-perfect lossless I2C DSD and PCM volume control. Most people may not notice many so called "bit-perfect" device on the market is bit-perfect ONLY When You Play At FULL Volume. If the volume is not set to maximum in the computer, the audio data is scaled/altered before sending to the DAC chip and the result is signal to noise ratio seriously affected. The DSD sound volume is controllable using our xmos DSD combo in all USB audio 2.0 compatible OS including WINDOWS/MAC/LINUX system volume mixer. Our xmos combo can use the same output ASIO: foo_dsd_asio in foorbar2000 to play PCM and DSD music file. No need to go to foobar2000 preferences everytime to change the output device. 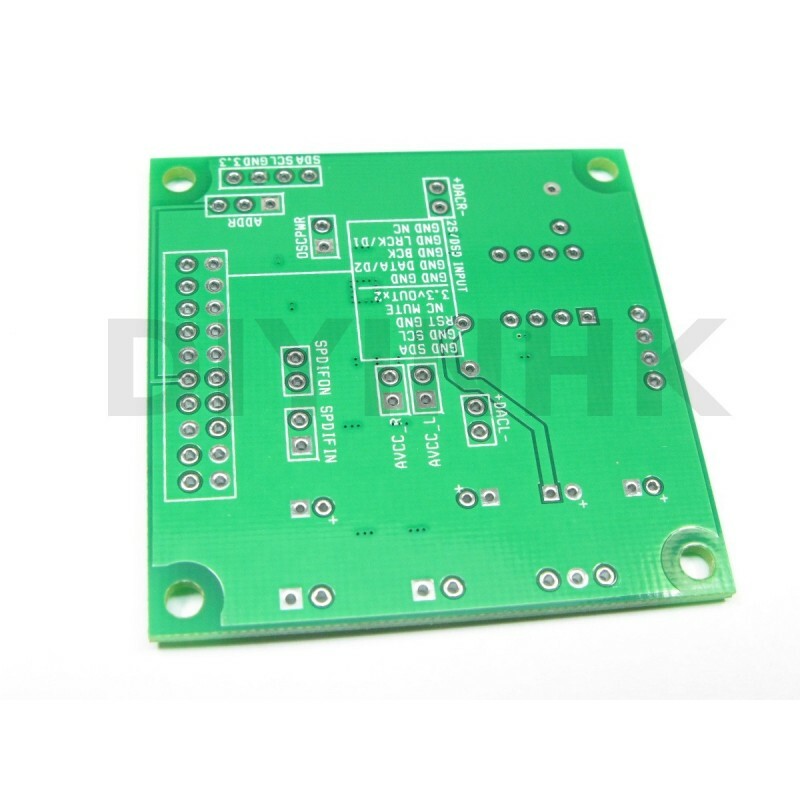 The circuit is designed and printed on the PCB directly. The IIC volume control is only active when you are moving the volume bar to change the volume, it is totally stopped when not in use. No pop sound. 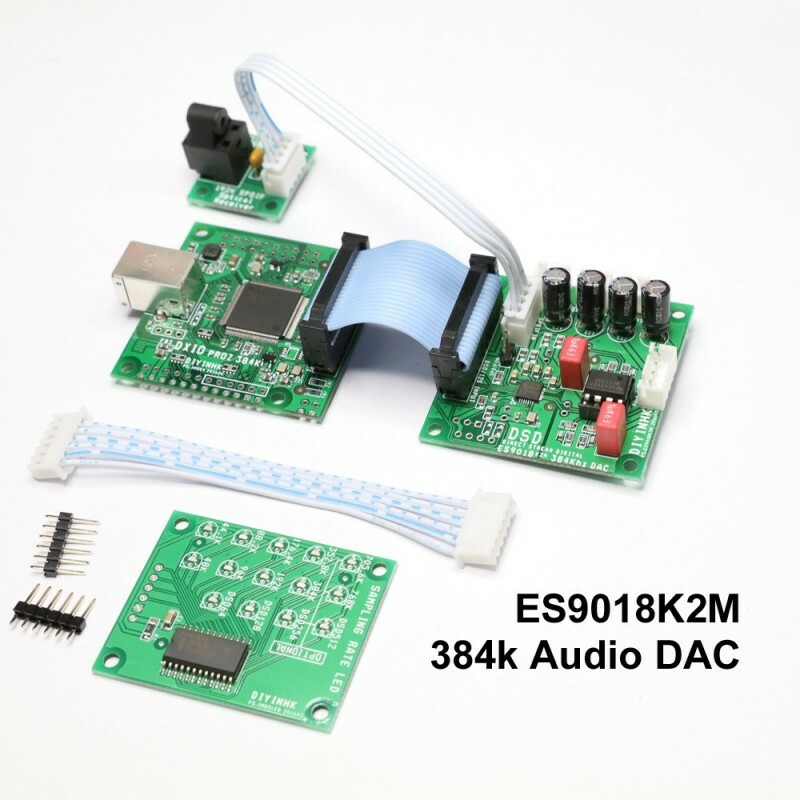 The ES9018K2M has automute feature when switch between pcm and dsd. 8)Can I increase the voltage of AVCC to higher than 3.3V as I done to the old ES9018? 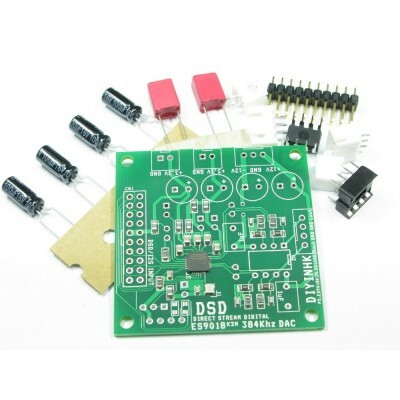 1)The SPDIF input(labeled SPDIF IN) signal level requirement is 3.3V, it is directly connected to the ES9018K2M DAC chip to achieve lowest jitter performance. It can be used to connect SPDIF optical receiver directly(Toshiba TORX147 or equivalent). If it is used to connect coaxial SPDIF, an interface circuit must be used to convert the standard spdif 0.6Vp-p to 3.3V logic level. 2)For bit perfect playback at any volume when using our customized firmware XMOS ES9018K2M PCB combo, please use the Windows/MAC/Linux OS default builtin system master volume mixer control. Don't use the foobar volume control, it scale/alter the audio data internally. 3)The PCB is designed to be DIY friendly. Diyer can cut the trace and uses the socket labelled AVCC_L(3.3V), AVCC_R(3.3V), oscillator VCC(3.3V) for each to use individual power supply. 6)For Diyer requires more deeper customization, the ES9018K2M datasheet can be requested from ESS authorized distributor directly. 1) Double check the polarity of all capacitor is correct and no short circuit of soldering joint to each other before connect power input to the PCB, the capacitor will explode immediately if it is reversed connected. No return is accepted after the pcb is soldered.